Whether you need to grace your face with tender TLC, restorative moisture, protection from drying stressors, or age-defying power, our All Season Serumholds the key to skin harmony. Whether you need to grace your face with tender TLC, restorative moisture, protection from drying stressors, or age-defying power, our All Season Serum holds the key to skin harmony. Organic Ingredients: Camellia oleifera (Camellia) Oil, Simmondsia chinensis (Jojoba) Oil, Santalum album(Sandalwood) Essential Oil, Commiphora myrrha (Myrrh) Essential Oil, Boswellia carterii (Frankincense) Essential Oil, Helichrysum italicum (Immortelle) Essential Oil. I believe our skin tells us a lot about us…when we are tired or stressed. When I read about the bottle at first I was skeptical but the words on the bottle still had me drawn to this product. I am a shift worker flipping back and forth between days and nights. So my skin just doesn’t always get that time to rejuvenate during that time of sleep that our body requires to getting everything so. I started using this serum and wow I have a beautiful glow no matter how much sleep …I look healthy and it also calmed down my red blotchy areas I get every year in the springtime. So thank you guys for making a product that works great and worth the price. After washing the face with Sea Buckthorn Best Skin Ever, two drops of the All Seasons Serum at night is all it takes to make your face feel and look heavenly! Immediate moisture and care is brought to the skin. The strength of the smell makes me feel as though the magical oils in this bottle are working wonders! I wake up with a refreshed face and happy mood. The oils in this serum are outstanding with the benefits of brightening and evening the appearance of my skin tone *** , seriously moisturizing, protecting and repairing. The benefits of this serum are endless! I also like to use the cell serum in the morning as an extra boost before applying my everybody loves the sunshine (ok, I am getting a little oil greedy here but they are absolutely worth it!). 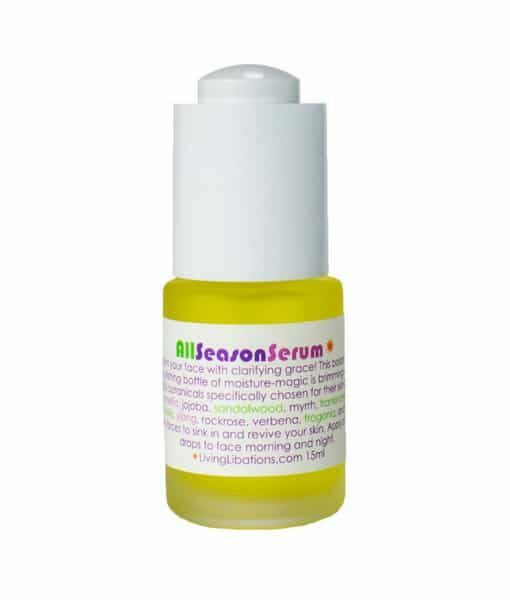 You could combine a drop of the cell serum to a drop of the All Seasons Serum or switch it up a bit like I do! Thank you Living Libations for combining the most beautiful and effective oils! Can’t live with out it! A balancing, nourishing and moisturizing blend of botanical essential oils that are rich in benefits for any skin type.There is no “limit” to the amount you can use but I’d caution you to use it sparingly since you’ll miss it so much when it runs out! The All Season Serum delivers nutrition deep into your cells so that your skin beams with hydration, plumpness, and gratitude. Love the brown glass bottle and dropper it comes in. I feel comfortable recommending this one to everyone because it’s so adaptogenic. It delivers whatever your skin needs. It’s the maca of facial oils.